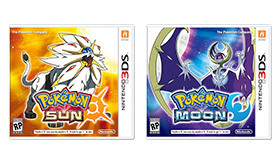 The newest Pokémon games are called Pokémon Sun and Pokémon Moon. The games will be released in holiday 2016 and are for the 3DS. This time around, the game lets you select between 9 languages. Additionally to English, French, German, Italian, Japanese, Korean, and Spanish which you could select in the 6th generation games, you can now also choose Traditional and Simplified Chinese. The official website clearly states there will be new Pokémon (obviously). Besides the already revealed Magearna (Type: Steel/Fairy) which will play a role in the next movie and is to be expected to be one of the new games' Pokémon, an incomplete model of a bird-like Pokémon was shown in the trailer. There are also the Zygarde forms left which are currently not part of any game but a connection to Pokémon Sun and Pokémon Moon is not yet known. The Virtual Console versions of Pokémon Red, Blue and Yellow will be able to make use of Pokémon Bank. The Pokémon transferred from there can be transferred to Sun & Moon afterwards. The transfer from the 6th generation games (X,Y, Omega Ruby, Alpha Sapphire) to Sun and Moon is said to work the same way. In the short announcment video you can see multiple sketches or finished buildings. One of them is also a newly designed Pokémon center. Last edited by Virtual Headache; 04-13-2016 at 12:24 AM.